MAGI’900, a large private museum space, is continuing to expand and surprise with its constant developments; soon it will no longer be simply a museum but the heart of a proper arts district, devised to create contact with the community at any moment during daily life. The new outdoor expansion is inspired by this utopic yet tangibly pursued idea. 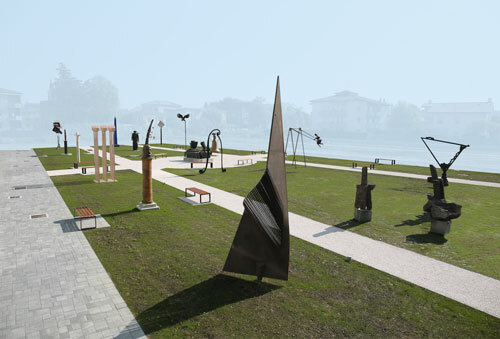 Starting 20 May, it will offer people a vast green urban area embellished with twenty or so large sculptures by well-known contemporary artists. A grassy plaza dedicated entirely to monumental sculpture, this large space extends and expands the pre-existing garden. It will always be open to the public and to citizens, and is already the beating heart of a new urban district, another project that will soon be implemented adjacent to the museum complex. Giulio Bargellini, collector and founder of the MAGI’900, is the mastermind behind this initiative, which will see a vast courtyard built around the new plaza of sculptures. Inspired by traditional historical architecture, it will be a hamlet with timeless charm, where art and life can develop in harmony; modern homes designed to return to the warmth of the porticoes and materials typical of Emilian architecture, just a short walk from the beautiful Pieve di Cento city centre. And so, while the museum will carry on its exhibits and cultural activities, the already accessible garden will offer citizens and visitors a place where they can get to know the creativity and original beauty of the pieces. As though suspended in an imaginary metaphysical world with their fairytale-esque figurations or their dynamic abstract shapes, all the sculptures resting on the bright green lawn will create a unique new way of experiencing the city, rediscovering ancient roots to stimulate a new approach in bringing together and enjoying the art of our time. Thus, the search for the aesthetic will always be in touch with those who wish to live in a unique, deeply humanistic environment, as it was envisioned to express and give visibility to ideas, emotions, and the magic of art, which can whisk you off to faraway places in your mind.